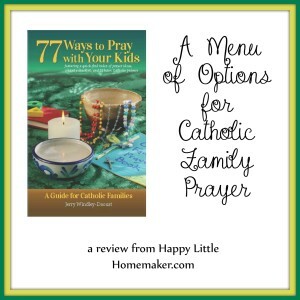 So far, my number one favorite prayer resource for Catholic families EVER is 77 Ways to Pray with Your Kids. It’s got practical ideas for every age, stage and family. There will be SOMETHING in there that will help you in your family prayer life. History & the Apostles Creed. 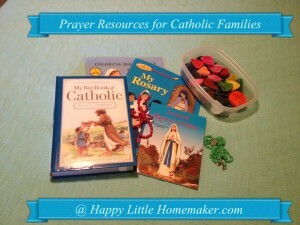 How to Say the Rosary & the Our Father. Meditation & the Joyful Mysteries. 15 Promises & the Hail Mary. 10 Blessings & the Glorious Mysteries. Indulgencies & the Glory Be and the Fatima Prayer. Misc. Additions & the Sorrowful Mysteries. Other forms & Hail Holy Queen. Prayer of St. Gertrude — for when your brain is scattered :).